Comprehensive and accessible, this breakthrough book presents a new model for building the "intrinsic" motivation crucial to today's work world, which is based on psychological rewards that workers get from the work itself. Kenneth W. Thomas, Ph.D., has an international reputation as a researcher and developer of training materials. He is the developer, with Ralph Kilmann, of the Thomas-Kilmann Conflict Mode Instrument (TKI), the leading measure of conflict-handling styles. It has sold over six million copies and been translated into several languages. 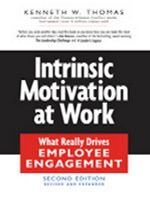 He has also conducted extensive research on work motivation and is the author of Intrinsic Motivation at Work: What Really Drives Employee Engagement, published jointly by Berrett-Koehler and the American Society for Training and Development (ASTD). With Walter Tymon, he has also developed the Work Engagement Profile, a measure of the intrinsic rewards that power work engagement. He has served as Professor of Management at UCLA, Temple University, the University of Pittsburgh, and the Naval Postgraduate School. He gives presentations and conducts workshops for groups of various sizes and has also served as faculty member for the National Association of Corporate Directors. What gets employees engaged in their work—strongly committed to doing the best job they can?